Do you love free printables as much as I do? If the answer is yes then you have found the right page. 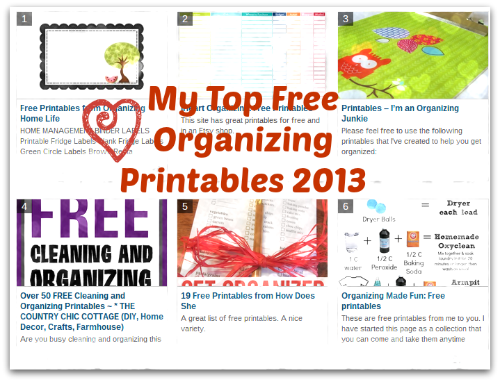 I have put together my top places for 2013 to find free and almost free organizing printables. If you have found a source of free organizing printables that I don’t have on this list that you think others would enjoy please add it to the list. Or let me know in the comments and I will go check it out and add it to the list. This list just doesn’t contain labels, but there are also planners and templates to make binders. There is something for every taste on this list. Do you love free printables as much as I do? If so then here is a list of websites offering free organizing printables and printables in general. If you know of any websites that offer free printables that is not on this list that you like please add them. You made those homemade treats with love, so dress them up a little-and don't forget the card! This set of free printable holiday cards was inspired by the Ziploc® brand Holiday Collection designs. Just print, cut and fold to add some holiday flair to your baked goods. Posted by Laura on October 8, 2013 · Comments Today on this 31 Days to Organized Closets series I thought I'd share something fun that would definitely add some organizational bliss to any closet. What is this I speak of? Why labels of course! And free ones at that. Whoot! Why not take a moment to subscribe to the Buttoned Up newsletter? Be the first to hear about new FREE (and timely) Buttoned Up printables, get a synopsis of recent blog posts delivered right to your inbox once a week, and of course get super discounts just for signing up! Free Printables Who needs Hallmark? Print and customize this designer card instead. Let your kids pretend to run their own café while learning their upper and lower case letters. Give your little one's lunchbox notes a feline touch with these printable cutout pages. This site has great printables for free and in an Etsy shop. Are you busy cleaning and organizing this month? I know I am. I use printable pages for many things in my home. I can always find free versions online of some really great printable organizers. I thought I would share some I had found with you all. A great list of free printables. A nice variety. These are free printables from me to you. I have started this page as a collection that you can come and take them anytime you'd like! Enjoy! There are some really great printables here. I really like the entitlement cards. After years of struggling with the planners designed for and by office workers, I figured out that it wasn't me that was the problem: it was the design of the planners. Creative people approach their work differently. Most of us don't work 8-5, and we don't have projects that we can plan to get done during the same times each day. Well, another year is almost over - so start planning 2014 with this free printable calendar! This time, I've gone for a very clean and simple design. Anyone else have a Craft Monster invading their homes? I did. In the winter of '09. They were dark days my friends. Dark days. Fear gripped me every time I opened a certain cupboard as balls of yarn and needles would start raining down. I dared not look at the carnage in my fabric drawer. I only recently started using a Meal Planner, and boy, what a difference its made! Every night I used to stand in front of the fridge, doors wide open, gazing at the dwindling contents and wondering what on earth I could cook for dinner. Ugh! It was stressful trying to be creative each night. After 8 long months and a LOT of trial and error, we launched our very first set of Large Planner Pages for the Academic Year in August of 2013. More trial and error followed, but with the AMAZING feedback from our friends, family and loyal customers, our shop has grown into a one-stop printable shop with a variety of planner sets and extras in three popular sizes. Wow, does time fly! It'll be 2015 before you know it. That's alright. I've got you covered! Here's your free printable 2015 calendars and yes, you can completely customize them! You can edit them all you want, then print, or skip the editing and just straight up print them!